I regularly post current images on my Instagram account – be sure to follow me there to keep up to date with what I’m shooting. And here’s the top five posts from last month, starting with Jessica’s wedding dress hanging while she prepared to marry Giac at this wonderful destination wedding in Portofino, Italy. As a documentary wedding photographer, I don’t arrange people or things like dresses and shoes for photographs. I photograph the day as I find it, making sure the bride and groom get an authentic, natural record of their day. But when I arrived to find Jessica’s dress already hanging in the window, I had to make a story-telling image from it. So rather than photographing the dress in full, I’ve decided to use the hem as a detail and incorporate some of the fantastic sea view from the window. Hopefully, images like this will transform Jessica right back to that moment, feeling the sea breeze and the butterflies in her stomach before the wedding ceremony! This is Harry and his best man getting ready before this wedding at Bluebird in Chelsea. It was a fun hour or two before the wedding as both Harry and Janine were getting ready at their South London flat. So with all the parents, bridesmaids and groomsmen, it was a busy scene with lots to photograph. But it’s always important when documenting a wedding, to simplify things in the photography. As well as those fantastic complicated and busy scenes, I also look for clean compositions and simple images like this one above. The plain wall serves well to offer an uncluttered background, and the composition of the two guys stretches to the edges of the frame. This is shot with the Fuji XT-1 and 12mm lens, and I’ve kept a low angle by using the tilt screen. The moment works as Harry is checking something in his jacket pocket while Alex is fulfilling his best man duties and checking he has the rings! You can also see Alex and Lauren’s One Whitehall Place wedding photography here. 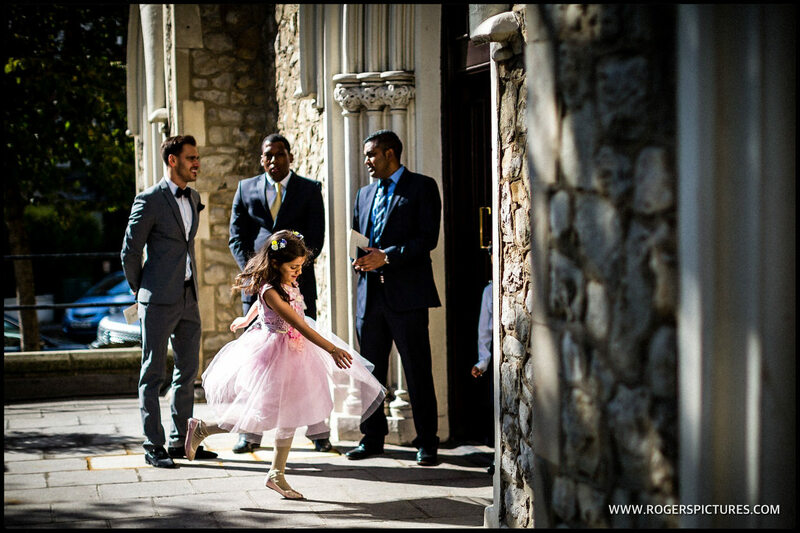 Julia was fashionably late arriving at Kensington Temple for her wedding to Dayalan, and this gave me the opportunity to shoot this picture of one of the flower girls twirling outside the church. Children are creatures of habit, so when I missed her first set of twirls, I knew that I just had to wait it out before I got another chance to capture it. The sunlight lifts her from the background a little as well. Here’s some more pictures from this unusual wedding venue in Hertfordshire. This is the moment Becky has her Grandma’s lace veil fitted before the Humanist wedding ceremony at Maunsel House in Somerset. It’s a fabulous venue, full of character and great light. The bridal preparation room is quite dark in the corners, but near the windows there is an amazing quality to the light. That’s what’s made this picture work so well, along with the framing between the arms, and a glimpse of the four poster bed in the background. Check out some more Maunsel House wedding photography. Lastly, a silhouette from Eliza and Nigel’s St Etheldrea’s Church wedding a couple of years ago. Please follow me over on Instagram to see a daily feed of some great documentary wedding photography from around the UK.